Tank Details: 36"x36"x12" tall tank. The Fish: (1)plecostomus, (2)clown loaches, (2)malawi golden cichlids, (2)malawi blue cichlids, (2)electric yellow. 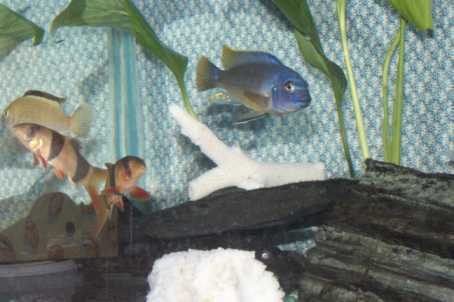 Comments: The plants i have are real,i find if i feed the cichlids often enough they seem to leave them alone. The plants i have in the tank i think are (water wisteria)and (cryptocoryne- wendtil).